How much time do you spend on the Internet? How often do you send e-mails? How often do you tweet? How often do you post a status message on Facebook? How often do you conduct a search on Google? The Internet has invaded the life of the average person so much so that you (in all likelihood) cannot go a day without logging in to one service or another. Whether it’s Twitter, Facebook, e-mail, WordPress, Blogger, or what-have-you – one thing is for sure: people are constantly doing something online. Now I am pretty sure that your curious mind has wondered – at least once – just how much is going on online at any given moment. Well here’s the answer to your question – not exactly in same terms, perhaps, but close enough. 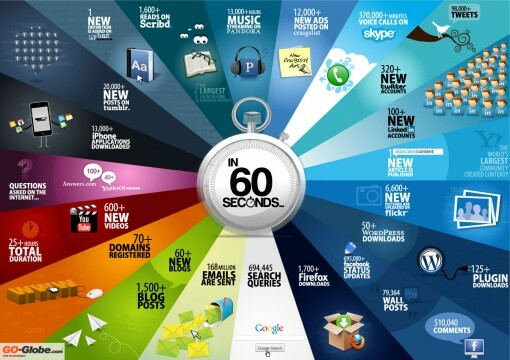 An infographic by Shanghai Web Designers ((60 Seconds)) tells you what happens on the Internet every 60 seconds – or every minute. more than 694,445 searches are done on Google? more than 6,600 photos are uploaded on Flickr? 695,000 statuses are updated on Facebook, 79,364 messages are posted on walls, and 510,040 comments are made? more than 168,000,000 e-mails are sent? So who was that again who said that e-mail was dead??? 98,000 tweets are published on Twitter? I don’t know if this includes RTs and @replies, though.